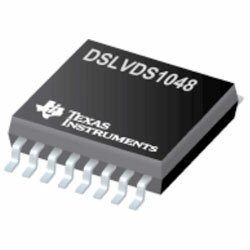 Texas Instruments DSLVDS1048 LVDS High-Speed Differential Line Receiver is intended for applications needing ultra-low power dissipation and high data rates. The device is created to support data rates in excess of 400Mbps (200MHz) using LVDS technology. The device accepts low voltage (350mV typical) differential input signals and translates them to 3V CMOS output levels. The receiver supports a TRI-STATE function that may be used to multiplex outputs. The receiver also supports open, shorted, and terminated (100Ohm) input fail-safe. The receiver output is HIGH for all fail-safe conditions. The device has a flow-through pinout for easy PCB layout. Typical applications include mltifunction Printers, Board-to-Board Communication, Test and Measurement, Printers, Data Center Interconnect, Lab Instrumentation, and Ultrasound Scanners.